Elizabeth Roena Patten Clements, matriarch of the sawmill family of Ray City, died in 1951. 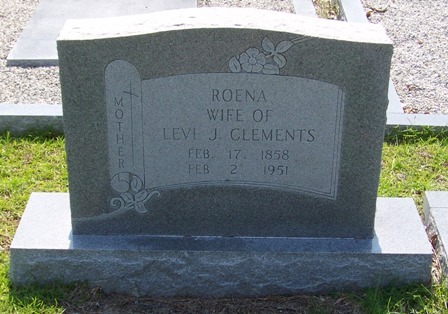 She was the widow of Levi J. Clements and a daughter of William and Elizabeth Register Patten. 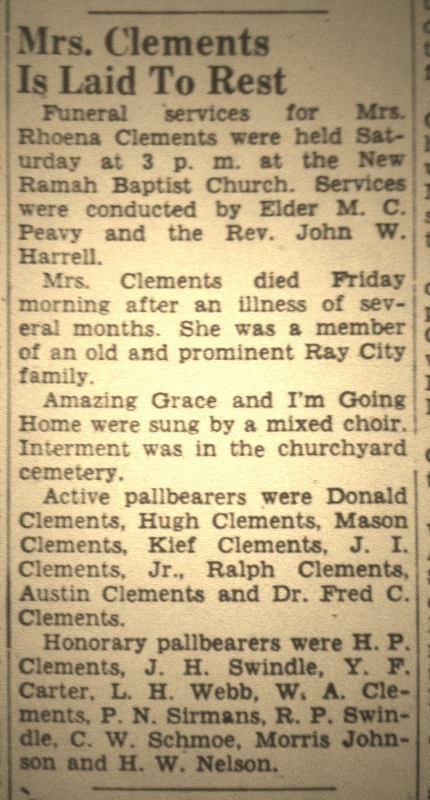 In the early 1920s the Clements Lumber Company was the largest business in Ray City, GA.
Obituary of Roena Patten Clements. Mrs. Levie J. Rhoena Clements, 93, passed away at her home in Ray City this morning about 10 o’clock. Funeral services will be held at New Ramey Primitive Baptist Church at Ray City at 3 p. m. Saturday. She is survived by a daughter, Mrs. Lillie Gaskins, five sons, Dr. H. W. Clements, Adel; J. L. Clements, Fort Meade, Fla; W. G. Clements, Ebb, Fla; and J. I and J. S. Clements of Ray City. Twenty grand children and 28 great-grandchildren also survive. Mrs. Clements was born in Berrien county and was a resident of that section all her life. Pallbearers will be the grandsons. Elder Marcus Peavy, pastor at Ray City, will conduct the services. He will be assisted by the Rev. John W. Harrell, pastor of the Ray City Baptist Church. Wiseman Funeral Home, Adel, will direct the arrangements. Funeral services for Mrs. Rhoena Clements were held Saturday at 3 p. m. at the New Ramah Baptist Church. Services were conducted by Elder M. C. Peavey and the Rev. John W. Harrell. Mrs. Clements died Friday morning after an illness of several months. She was a member of an old and prominent Ray City family. Amazing Grace and I’m Going Home were sung by a mixed choir. Interment was in the churchyard cemetery. Active pallbearers were Donald Clements, Hugh Clements, Mason Clements, Kief Clements, J. I. Clements, Jr., Ralph Clements, Austin Clements and Dr. Fred C. Clements. Honorary pallbearers were H. P. Clements, J. H. Swindle, Y. F. Carter, L. H. Webb, W. A. Clements, P. N. Sirmans, R. P. Swindle, C. W. Schmoe, Morris Johnson and H. W. Nelson.